Do you constantly feel unusually tired? Are you overweight or simply living in a body that you no longer recognize as yours? Or are you suffering from brain fog, skin problems, bloating and/or digestive complications, crazy sugar cravings, or emotional eating episodes? If your answer is yes to any of these questions, than Apoyo Lodge have the perfect escape for you this spring! Apoyo Lodge invites you to a spring detox camp where through detoxifying food, therapies and massage, yoga, and meditation, you will get to take control of your health and give your system the "reset" it needs! Your accommodation for this retreat will be in Apoyo Lodge which is a health and wellness boutique hotel and private retreat space, located in the Laguna de Apoyo Natural Reserve, right on the shore of the Laguna de Apoyo crater lagoon. Focused on plant-based, gluten-free cuisine, Apoyo Lodge offers the perfect setting for those who wish to disconnect from the outside world and focus on the self, while receiving personalized care from each one of its team members. Apoyo Lodge offers accommodation in 2 suites that can accommodate up to 3 people, and 5 double/twin rooms that accommodate a maximum of 2 people each. All rooms have private bathrooms with hot water and quality linen and towels. Some rooms have a balcony or patio with a lake view and some others have a forest view. You can choose whether you wish to share a room or have your own. Apoyo Lodge is offering you in their spring detox retreat program the opportunity to join a limited amount of determined participants who will embark on a guided 7-night detox journey to help their bodies get back on track and enhance their natural elimination and cleansing mechanisms. Healing the body does not happen overnight, but it needs to start somewhere and where could it be better than by the shore of a natural crater lagoon that is known for its medicinal healing waters in the company of a group of like-minded individuals? Your body is so wise, you wouldn’t believe it! It was designed to keep itself clean and healthy by just following your natural instincts. Detoxing has played a crucial role in human history across most cultures and religions, it is not just a trendy thing for celebrities to do these days. Unfortunately, most of today's western lifestyles don't support the body's mission of getting rid of the junk it no longer needs. Instead, most people overload their systems with damaging chemicals, toxins and fake foods/drinks with low nutritional value on a daily basis, which adds an incredible amount of work to your cleansing organs. When your body is not eliminating waste properly, chronic health problems, fatigue or unwanted extra pounds will irremediably become part of your life. What can you do about it? Don't worry, this is exactly what retreat has been designed to answer: this detox camp is designed to help you jump-start a holistic cleansing process and provide you with the tools you need to continue this journey on your own when you get back home. It is not rocket science, but you need to know where to start, right? Eat the right food and drink the right fluids: a combination of fresh juices, filling smoothies and hearty soups to nourish your body whilst giving it a chance to do some much needed internal cleansing. In between, you will be drinking coconut water and herbal teas that support liver, gallbladder, and kidney detoxification. Plenty of water of course! Practice the perfect yoga and meditation routines to help eliminate the toxins from your bloodstream in a gentle and restorative way. Relax by the lagoon, swim in its pristine healing waters and get pampered throughout the week with our healing therapies. Learn the basics of keeping your body healthy and clean during our informative workshops and activities. Meet with Miriam for a one-on-one session to discuss your particular health goals and to draft a plan of action to take home with you. Miriam is a Health and Lifestyle Coach, Detox Fairy Godmother and Co-owner of Apoyo Lodge - Nicaragua's 1st 100% vegan hotel. She lives full time at the lodge, helping people bring back their curiosity for life and become a healthier, happier version of themselves both through their visit to the lodge, her workshops and retreats. She counts on the invaluable help of her partner in crime, Manuel, and the smiles provided by her stepdaughter Yahoska and a bunch of rescued animals. This retreat will take place in Laguna de Apoyo Natural Reserve located between the departments of Masaya and Granada in Nicaragua. For the detox retreat, everyday for all meals you will be offered a nutritionally balanced, clean diet consisting of raw meals, soups, super food smoothies, fresh green juices accompanied by unlimited herbal teas and coconut water throughout the day. You will be eating every 2 hours, so you will not have a chance to go hungry. If you are new to detox, your instructor, Miriam will guide you through it and support you along the way. Apoyo Lodge strives to source seasonal organic (when possible) plant-based whole foods found locally in Nicaragua and to promote mindful eating. They wholeheartedly believe on the saying that "You are what you eat" and for that reason Apoyo Lodge serves fresh, healthy, authentic, nourishing, and real dishes to their guests. Meals at the lodge are a combination of raw and cooked dishes made with exclusively with plant-based whole foods which come from the earth. Apoyo Lodge wants you to live in harmony with mother nature and respect all earthlings, therefore all meals are free of meat, fish, dairy, and eggs. As they also want to do what's best for your human body and mind, refined sugars, nasty oils, and preservatives are also banned from their kitchen. Strong emphasis is placed on incorporating whole foods into all dishes such as local dark leafy greens, herbs, veggies, tropical fruits, fermented foods, sprouts, nuts, grains, and seeds. Apoyo Lodge's menu has been mindfully created including simple, yet delicious dishes from global cuisine adapted to Nicaraguan produce, keeping in mind basic principles of nutrition and food combination - you will be getting more than enough of the nutritional value you need to thrive and feel your best. Please note that they are also very happy to cater for most food allergies and intolerance's, Apoyo Lodge will try their best to accommodate all your dietary needs (by always respecting an animal product-free environment). Hiking through the forest of Apoyo can be very interesting. Even though the majority of wild animals are not easily seen, during the hikes, it is possible to see some interesting species. The howler monkeys are moving constantly from place to place and it is possible to hear or see them in the forest. There are a couple of hike options from Apoyo Lodge and they will be happy to provide information for you to do a self-guided hike. Muscle tension? Accumulated stress? Lower back pain? Sounds like you need to treat yourself to a well-deserved massage during your stay. Apoyo Lodge offers professional massage services at their palapa, surrounded by the tropical trees and the sound of the waves from the lagoon. If what you need is a pampering session, manicure and pedicure services are also available to the guests. 2 massages for 60 minutes each. 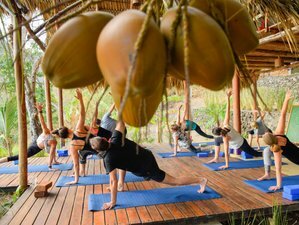 Apoyo Lodge is a health and wellness boutique hotel and private retreat space, located on the shore of the healing Laguna de Apoyo, Nicaragua.